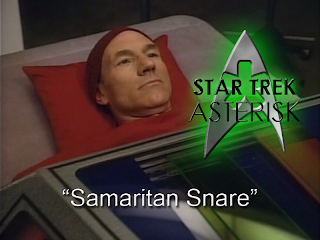 Star Trek: Asterisk "Samaritan Snare"
Geordi gets abducted by the Three Stooges who are all Curly, while Picard gives his heart to the wrong doctor. So the Enterprise is en route to survey a pulsar cluster, a mission to which Picard was really looking forward, when Pulaski tells him that he needs a new heart. To be clear, this replacement will be his second new heart. His original heart was "damaged" and apparently his first replacement heart was faulty. Picard is none too happy with this turn of events since 1) he'll miss the pulsar cluster and 2) he'll look weak in front of his crew. Reluctantly, he agrees to go to Starbase 515 to have the surgery. Well, guess who else is on his way there! That's right, Wesley Friggin' Crusher! Wesley needs to go to take his Starfleet Academy exams, so he'll be taking a shuttle and Picard will shuffle off along with him, which surprises Riker because he was so looking forward to that pulsar cluster. 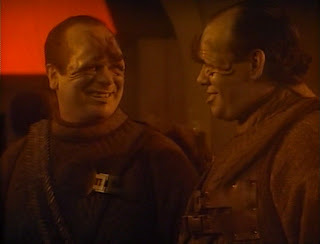 Regardless, Picard refuses to confide the reason he's going and Wesley spends the rest of the time trying to think about what the heck he's going to say to the captain on the long trip. After Wesley and Picard are on their way, Riker gets a distress call from the starship Mondor piloted by a group of Pakled aliens who may as well have been piloting the short bus. The Pakled explain that they're collecting things to make their ship go, except it's not going and they need someone to fix it. 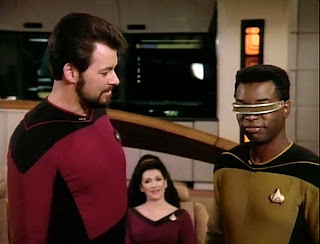 Geordi agrees and beams over. Worf objects to sending the chief engineer, but Riker believes the Pakled to be harmless because of, ya know, the stupids. Troi, however, finally comes to the bridge saying that the Pakled are not at all feeling helpless and that Geordi is in great danger. Because this warning couldn't have waited until after Geordi beamed over. Meanwhile, back on the shuttle, Wesley tries to make conversation with Picard. He asks why Picard has come along and Picard admits it was not his idea, and that he hates the thought of getting another cardiac transplant. This is new information to Wesley, so he handles it the best way he can: by apologizing and shutting up. On the Mondor, as soon as Geordi is finished making repairs to the engine, the Enterprise attempts to beam him up, but finds that the Mondor has raised shields. They stun Geordi and then tell Riker that if he wants Geordi back, he'll hand over all the information in the Enterprise computer banks. "And then we will steal your wi-fi." On the shuttle, Picard and Wesley share a meal of sandwiches while Picard tells the story of how his heart was damaged. 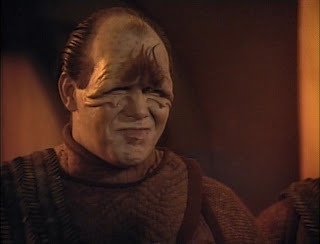 As a young ensign, he got into a fight with some Naussicans and while he had one in a headlock, another impaled him through the back (something with which Wesley is somewhat familiar) and the only reason he survived is because there was a medical facility nearby. Picard says these were the days when he was an impetuous youth and probably a little more like Tom Hardy than Patrick Stewart. Less Xavier, more Bane, if you will. When they finally get to the starbase, Wesley admits that he was instructed by Pulaski to make sure that Picard got to his appointment. When Picard lies on the operating table, the surgeon says he expects no complications. There are complications. Back on the Enterprise, they get word that Picard is having complications with his surgery and they should probably get over to the starbase to help him somehow. But they need to get Geordi back from the Mondor. So they devise a plan to trick the idiots into lowering their shields. They signal to Geordi to make it look like he's giving them weapons, but once they actually get in a "fight" with the Enterprise, they'll fail. The Pakleds fall for it hook, line and sinker. Convinced that they are not as strong as they thought they were, they lower the shields and Geordi beams back to the Enterprise. stupid people with big sticks. On the operating table, Picard wakes up to find that Pulaski has finished the surgery and it was a complete success. The complications he was having earlier turned out to be because Picard was so great, or something. In any case, Pulaski was able to pull him through. When Picard gets back onto the bridge everyone applauds, but he says that's really not necessary. He turns the attention on Wesley who passed his exams and will be continuing on the Enterprise. He then concedes that "rumors of his brush with death were greatly exaggerated." So now he can finally go survey that pulsar cluster like he always wanted to. Here's another example of having two completely disconnected plots in an episode, but for some reason it didn't bother me in this one. Maybe it was because they were both pretty interesting. They didn't feel forced or rushed and held together quite well. What was really interesting, however, was learning about Picard's past and learning more about his character; that he's a man who cares about his image. And the lesson about stupidity being dangerous is also one that many should learn if they ever plan on working with a group. Thumbs up to this episode.